Any woman engaging in the type of activity that could potentially harm their eyes most certainly needs to make sure that some of the most vital organs in their body are properly protected. For example, if you are an avid hunter, you want high quality safety glasses that will shield your eyes when shooting. If you are a motorcycle enthusiast, you want some eye wear that will protect your eyes from reflective glares and bright sunlight as well as eye wear that will enhance your visibility in the rain, dark areas, or overcast areas. Whatever potentially dangerous activity it is that you engage in on a routine basis, make sure that you have the right eye wear for the situation. And we are happy to say we are here to help you do that! 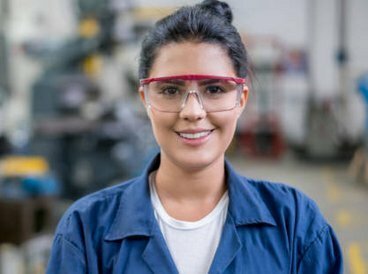 In this post, we will introduce you to some of the very best safety glasses on the market that are made specifically for women. eir needs. Firstly, regarding the lenses, women can choose from the following colors: clear, clear with blue blocker lenses, transition gray, transition brown, transition vantage, transition Xtractive, DriveWear, polarized gray 3, polarized brown 3, light gray, dark gray, dark brown, American gray g-15, yellow, orange, and light pink. For lens material, women with single vision can choose polycarbonate 1.59, trivex, high index plastic, or standard glass, all with varying price ranges. These glasses are suitable for anyone with single vision, bifocal FT-28, bifocal FT-35, or progressive bifocals. Additionally, the following specialty coatings can be constructed into the lenses: anti-reflective coating, anti-reflective with blue blocker coating, anti-scratch coating, UV protection, anti-fog treatment, green mirror coating, red mirror coating, gold mirror coating, blue mirror coating, and silver mirror coating. Finally, women who purchase these glasses have the option of including accessories such as a protective black hard case, soft black microfiber carrying bag, black retainer cord, maintenance and cleaning kit, cleaning towelettes to combat fog buildup, a soft, black microfiber cleaning cloth, and soft lens wipes. The frames are plastic and are designed with a wraparound style and extra side protection. These safety glasses are also ANSI Z87 certified and come with added temples for a more comfortable and secure fit. th a Black Stream Frame: These safety glasses give off an effortless adventurous feel and edgy style. They meet and exceed the high impact standards of safety set forth by ANSI Z87.1 as well as optical performance standards. One of the most attractive features of these safety glasses is that they are built with a super durable nylon frame designed for high impact situations. In addition to a sturdy frame, this safety eye wear option is built with shatterproof lenses. In addition to ANSI Z87.1 safety certification, these glasses have an OSHA grade protective rating. Although there is only one frame color option (black streak), the glasses can be fitted with a variety of lens colors ranging from light pink to dark grey to orange. There are also a few specialty options to choose from including transition lenses, polarized lenses, and clear lenses, best for using indoors or in overcast situations. Additional options include protective coatings such as anti-fog treatment, scratch-resistance, and anti-reflecting coating, among other things. Although there are additional options to choose from at an extra cost, all lenses come with complete UV ray protection. If you have a material preference, you can choose a polycarbonate, trivex, high index plastic, or thindex plastic for your lenses. RX-W200 Prescription Safety Glasses: These safety glasses are a bit more playful than the other eye wear products that we just introduced, at least stylistically speaking. The frames are designed with fun, “dancing” stars and women can choose between black frames with a white star design or deep blue frames with a black star design. But don’t let the carefree style of these safety glasses fool you; they still do the important job of protecting your eyes. These safety glasses meet and exceed the ANSI Z87.1-2003 standards for safety and are constructed with a chemical resistant material. These frames fit securely, yet comfortably around the head and they boast a firm temple design, thus adding more durability and side shield protection. These frames are most suitable for women with medium sized heads and the measurements are as follows: 16 mm bridge, 134 mm frame width, 125 mm temple, 55 mm lens width, and 40 mm lens height. When purchasing these safety glasses online, you can type in your exact prescription to get the right corrective lenses for your eyes. This eye wear option caters to anyone who needs progressive bifocals, bifocal FT-35 lenses, bifocal FT-28 lenses, and single vision lenses. If you need some extra gear to keep your safety glasses protected when you aren’t using them, you can choose from plenty of accessories for a small extra cost. A few examples of the different accessories you can get include a retainer cord, hard shell protective case, microfiber drawstring carrying bag, cleaning kit, retainer cord, and cleaning towelettes to combat fog. Finally, if you need some extra protective coatings for the lenses on these glasses, you could get anything including anti-reflective coating, UV protection, anti-fog coating, and scratch coating. You can also choose from a series of colored mirror coatings including silver, blue, gold, red, and green. ArmouRX Prescription Safety Glasses: For all the women who love a bit of boldness and color added to their wardrobe, they will love these vibrant safety glasses. The frames are built with both plastic and metal material, making them comfortable yet ultra durable and secure. You can choose between a green frame color and a purple frame color, with the frame design remaining the same on each. In addition to color and material, women should know that the shape is rectangular and ideal for anyone with small to medium sized heads. Although there are only two frame color options to choose from, women have many lens shades available to them including, but not limited to, pink, yellow, orange, light gray, dark gray, dark brown, clear, and American gray. For an added cost, women can get a custom-designed polarized or transition lens. Regarding lens material, women can opt for a standard glass, high index plastic, trivex, or polycarbonate. When purchasing these glasses online, you can put in your specific prescription to get the custom-design corrective lenses that are right for your eyes. The lenses can be designed for anyone with bifocals, progressive bifocals, or single vision (both nearsighted and farsighted). Looking for other great prescription and non-prescription safety eye wear options for women? Feel free to contact us today with any questions that you have or assistance you might need. You can also keep reading our other blog posts for more free resources or visit our official website to browse our vast selection of eye wear options available for virtually all purposes. Whether you need protective eye wear for athletic activities, outdoor use, welding, motorcycle riding, or any other purpose, we are committed to helping you find exactly what you need!